LuxSci is in the process of re-imagining and re-inventing the major components of its web-based user interface …. from the ground up. We are taking some of the most important feature requests from our customers, together with the newest technologies that have matured over the past few years, and re-designing these major components to be simpler, faster, modern, and slick. Additionally, along with changes to the WebMail composer, we have updated many other small user interface elements and libraries to support these changes and planned changes. Recipient lines with auto-complete suggestion from your address books, visual indications of security, automatic validation, and display of recipient names instead of email addresses inline. Cc and Bcc lines available as needed. 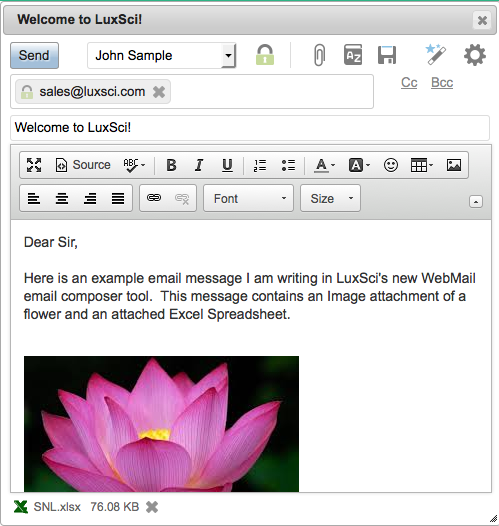 Almost all of the features of the old LuxSci WebMail Composer remain, but are now streamlined. The LuxSci WebMail redesign is so pervasive, that we are doing it in phases and releasing each phase as a “Beta Preview” so those who are interested can try it out before it goes “live” and becomes a new standard part of the LuxSci interface. using your regular LuxSci username and password. Use this beta site at your own risk. By the very nature of “Beta” software, it may contain bugs and issues that could affect the integrity and/or security of your data. For example, for security reasons, we are currently restricting HIPAA compliant paid accounts from logging into the Beta version of LuxSci. You may request a Free Trial to test the Beta. If you do use the Beta site and find a bug or have a suggestion, please make a Support Ticket and our development staff will review. While we appreciate all suggestions, not all suggestions will be incorporated into updates to the Beta versions. Some will be deferred until a later date. Some may be discarded as things that we are not willing to consider implementing. The Beta site is merely a single server setup for previewing the new software. It is not designed for large numbers of concurrent users or resiliency in case of hardware failure, etc. As such, we do not recommend that everyone switch over and continuously use the Beta site as their new main interface. The Beta site may be taken offline periodically for updates and changes; it may also have new software installed on it frequently, causing very short outages. Each one of these is a significant project to redesign and updates will be made available via the Beta site for each phase as they are ready. Check our FYI Blog, Facebook, and Twitter for announcements. Welcome to the beginning of the new LuxSci! LuxSci’s New WebMail Composer FAQs — How do I …? This entry was posted on Tuesday, June 24th, 2014 at 9:49 am	and is filed under New Feature Announcements. You can skip to the end and leave a response. Pinging is currently not allowed.